You Could Have Fooled Me!! So I get to Weight Watchers with the idea in my head that I’ve gained or at least not lost due to my faux pas with the grilled veggies and sea salt during the week. I didn’t even wear socks because I thought it would help me out on the scale. Ok, that’s goofy. Someday I’ll do a whole post about the stupid things people do to be sure they’ve lost. I’ve been collecting them over the years and they are quite funny. I got on the scale and Frank was taking his time because I needed a new weekly card. He looked at my old card, then looked at the screen…did it again and then did it again…Ok, Frank I’m Waiting!! Then he said…”How did you do that?” I said, “What?” He said, “Three.” I’m about to give him my whole grilled veggies and sea salt story…throwing in the high humidity for good measure when I stopped myself. I asked, “Up or down? He said, “Down!” Down? DOWN??? I couldn’t contain myself…I spun around the corner of the desk and gave him a great big HUG!! I always tell Frank he’s my good luck charm but he doesn’t believe me. I really couldn’t believe it. I am excited to reach this. I’ve heard in the past that if you do all of the right things-eat right, exercise, drink your water, your body will find its own level and you’ll stay there. I should probably do some research on that. I’m going to do my best to stay where I am AND to stop worrying about it. I think I agonize over it too much sometimes. After reading Portia de Rossi’s book, I see some of her habits in what I do, only not to that extreme. You’ve really got to be aware of what you do both positive and negative. 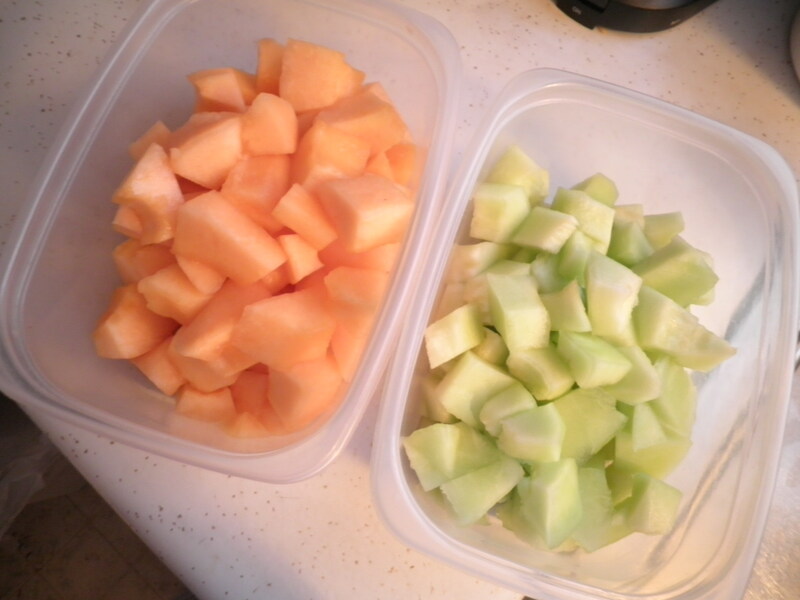 On the positive side, I got up early today to cut up some fruit! Our kitchen is SO hot because of our 40-year-old refrigerator, so any work you need to do in there should be done early. Also there are no vents for the A/C because the house is so old and was built before the A/C was put it in! So early morning fruit work was necessary. 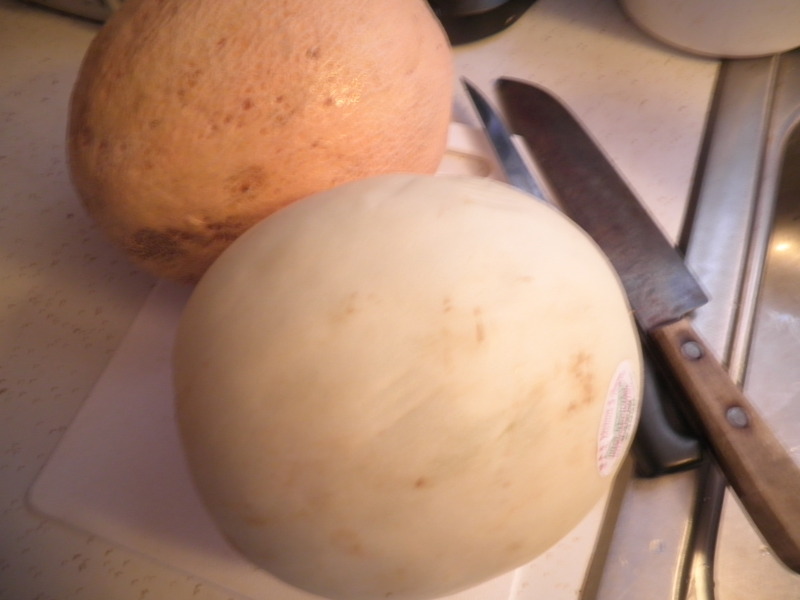 A cantaloupe and honeydew that I got earlier in the week from the produce stand. They were definitely in need of prompt attention. Sitting in the hot kitchen for the last few days was not a good idea. I’ve gotta do an overhaul on my fridge to have more room so when I bring the melons home they can go right in the fridge. Ralph had to be out of the house most of yesterday, so I spent my day working in the bedroom. I went through a great many things and found lots of things to send to the Rummage Sale, take to Goodwill and give to Ele. It served another purpose too, it helped me move some of my already packed things from in front of one of the A/C vents in the bedroom. This will help a lot with cooling the bedroom more efficiently. So excited about yesterday…I still find it hard to contain myself. I’m off to sort and pack…and stay On Track!! 🙂 Happy Sunday!! This entry was posted in Uncategorized and tagged books, fruit, Weight Watchers. Bookmark the permalink. I’m so proud of you!!!! You work so hard at being a WW. Now you have reached your personal goal. You must be so proud of yourself. But, never forget Portia’s book. That really impacted me. Looking at the pictures of her when she thought she was perfect….wow, she looked like a bag of bones. I do believe that so much of our body image comes from our minds and not our actual body. I’m so proud of you!!!! Ele!!! Somehow, I didn’t reply to you yesterday…So Sorry!! I appreciate all of your love and support in this effort. I couldn’t do this or so many other things in life without you behind me. Hugs to YOU!! Congratulations! You definitely should be so proud of yourself for accomplishing what you have with WW. It sounds like a fabulous and effective program. Ameena, it can be so frustrating when you try hard but don’t show any change, then go through a stage where you don’t try and THEN you get the results. Our bodies really do NOT co-operate sometimes! I’m hoping I can keep myself at this weight. I feel so good when I’m at this weight. I think I just need to take a deep breath and go with it. If I have faith in myself, I can continue to do it. Thanks, Ameena! Hot damn! You’d been working hard on that last couple of pounds!! Thanks, Val! I try to stick with it! 🙂 Congrats, lady bug! That moment when you realized Frank never said up or down must have been crazy. P.S. Barnes & Noble date soon! Thanks, Ms. Kristen! Yes, my head was spinning! Keep me posted on our date! And that melon looks delicious! I’ve had a hard time getting good ones this year. Hi Tina! Thanks so much for the support and encouragement. You are certainly one who knows how to stick to a goal! 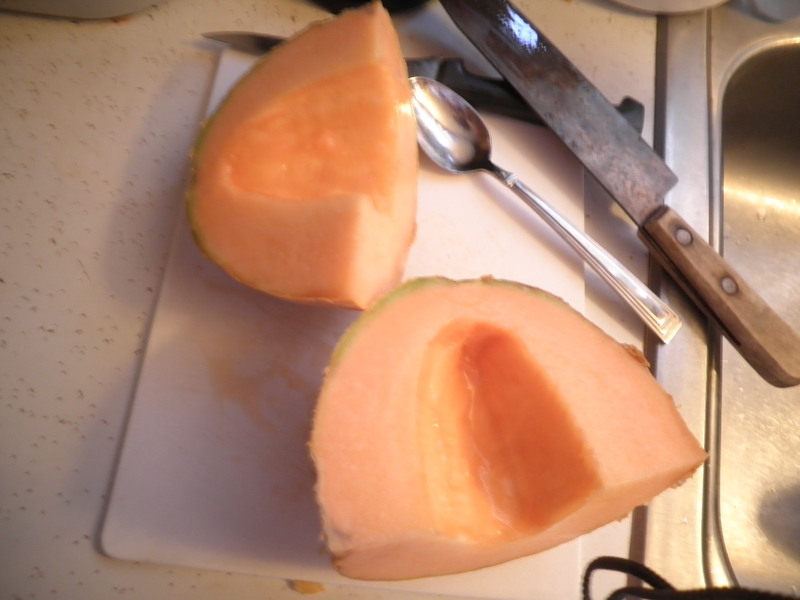 We’re lucky here, most of the melons have been really good this year. I had some of these last night and they were yummy! Now the pineapples…not so much luck there. Take care!